…there was a young girl called Sam, who loved to dance and sing and do gymnastics. As Sam got older she still loved to dance…but the sports? Not so much. Still, she would dance and dance – at nightclubs and festivals and parties – savouring the pure joy of carefree, hands-in-the-air shape-making. She never gave a second thought to her joint health, because….why would she? She was young and fit and healthy. If you mentioned joints to her she’d probably think you were referring to drugs or something. Ah, the blissful ignorance of youth! I am sitting on the veranda at my parents’ villa in Spain, feeling the welcome warmth of the sun’s rays on my face, releasing the tension in my aching bones. Current freezing UK temperatures do nothing to relax the body, as we hunch ourselves over against the elements, heads down, bracing ourselves for the wintry onslaught each time we (reluctantly!) leave the house. Consequently, we can feel stiff and achy in the winter months, longing for the lazy, hazy days of summer, when we’ll unfurl our limbs and stretch out in the sunshine. As my days are currently spent writing, when given the option of a few weeks in warmer climes I jump at the chance. Well, who wouldn’t, eh? All I need is my phone and laptop; my ‘office’ can just as easily be a beachfront café in Alicante as my kitchen table in Kent. It’s a no-brainer. As well as the restorative powers of warmth and sunshine, throughout my fortnight’s stay in Spain and for ten weeks thereafter I’ll be giving nature a helping hand by trialling GOPO Joint Health. For the first 3-5 weeks: 3 capsules twice daily, then the maintenance dose of 2 capsules twice a day. Rose-hips also contain other vitamins and something called galactolipids, one of which is called GOPO (glycoside of mono and diglycerol). Imagine a light switch: studies have proven that GOPO can switch off genes responsible for inflammatory joint destruction, and switch on ones that produce collagen and cartilage. Clever, huh? In the early 80s, Danish osteoarthritis sufferer, Erik Hansen, was recommended to try a rose-hip marmalade to ease his symptoms. He was so impressed with the painkilling effects that he began producing and distributing dried rose-hip powder, which proved extremely popular with arthritis sufferers. Later an interested inflammation specialist instigated clinical trials and the efficacy of the preparation was confirmed. The active compound of the rose-hips have been clinically proven to help reduce joint pain and stiffness, improving flexibility and mobility. Studies show that 8 in 10 patients reported a reduction in pain after 3 weeks of active treatment, and a 40-50% decrease in the need for painkillers and anti-inflammatories. It is completely natural and has no known side effects. I’ve been taking GOPO for a few days now, and have been experimenting by taking it in the capsule form as well as emptying them and sprinkling it on my food; it has a nice mild fruity flavour. Being overweight puts additional strain on your joints – reduce portion sizes and increase your daily activity. Menopause and middle-age tend to bring with them a reduction in metabolism, so if you eat the same amounts at 40+ as you did in your twenties you’re likely to gain weight. Depressing but true! …like nobody’s watching. Increased activity gets the blood pumping and helps oxygen and nutrients reach the joints. Any excuse to shake a shoe! As an ageing raver, anything that assists in allowing me to tear up dancefloors, showing those youngsters how it’s done for years to come, gets the thumbs up from me. If rose-hips are what it takes to keep me hip rather than needing a hip replacement, then bring on the GOPO, I say! So, it’s now 6 weeks into my GOPO trial. How am I finding it? Well, I’m pleased to report that I’m feeling fab-u-loso! Ok, so I’m still leading a pretty relaxed lifestyle as I’m working from home writing my blog and other publications, but the joint pain I’d previously been experiencing is very infrequent – negligible in fact! Since I started the trial I’ve been clubbing several times, and I do feel the post-party aches have been greatly reduced. Woohoo! I daresay there are sceptics who’d dismiss it as just mind over matter, but so what? Even if there is an element of the placebo effect, I’ll take that! The capsules are reasonably priced and simple to take (at mealtimes – I keep them on the kitchen counter so I don’t forget), so why not? I have also had several comments that my skin is looking good in recent weeks. I had previously been suffering from a rash on my chin, but it’s completely disappeared and my skin is generally more radiant. I’m not sure if this is down to the GOPO, the fact that I’ve also been trialling some new skincare products, or a combination of both, but rose-hips are amazing for the skin when applied as an oil, so it stands to reason that they will also improve the skin when taken internally too (although GOPO don’t make this claim). Rose-hips are high in vitamin C, a powerful antioxidant, which helps reduce damage done to the skin by free radicals, such as pollution and the sun. 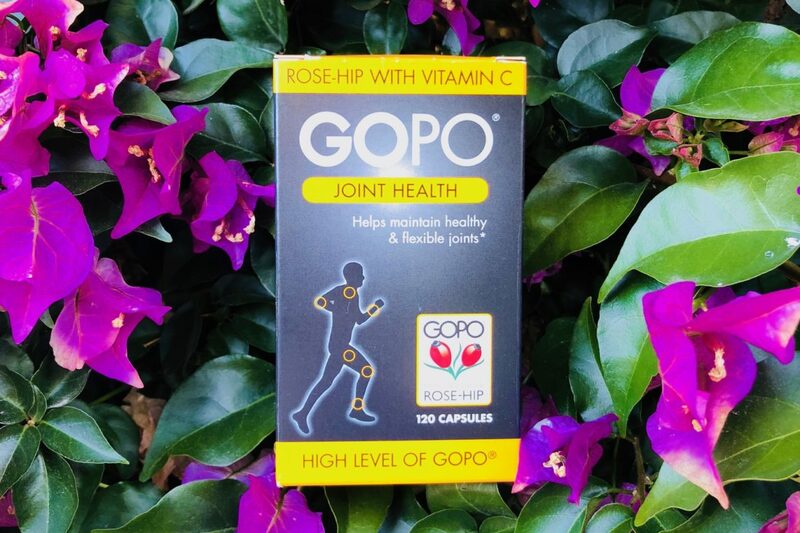 GOPO® Joint Health is available in Boots and independent chemists nationwide and is priced at £18.99 for 120 capsules and £26.99 for 200 capsules. They are currently available on a 3 for 2 offer. Click here to buy. Stay tuned: I’m trialling GOPO for 12 weeks, with an update 6 weeks into the trial and a review of the results at the end. Wish me luck!